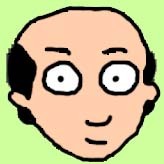 Welcome to The Many Faces of Dr. Katz, your infomation hub for Comedy Central's Emmy winning cartoon, Dr. Katz Professional Therapist. This site was last updated on August 3rd, 2009. Buy the Dr. Katz Professional Therapist Season 1 DVD at Amazon now! Buy the Dr. Katz Professional Therapist Season 2 DVD at Amazon now! Buy the Dr. Katz Professional Therapist - The Complete Series DVD set at Amazon now! This site is in no way officially affiliated with the "Dr. Katz Professional Therapist" TV Show. All information and images from this site are used strictly for non-profit use. Copyright 1995-2000 Comedy Partners, Popular Arts Entertainment, Tom Snyder Productions, and Comedy Central all rights reserved.